NEW YORK (JTA) Click for full report. July 5, 2018 — Max Fuchs, an American soldier who helped lead a historic Jewish religious service in Germany during World War II, has died. 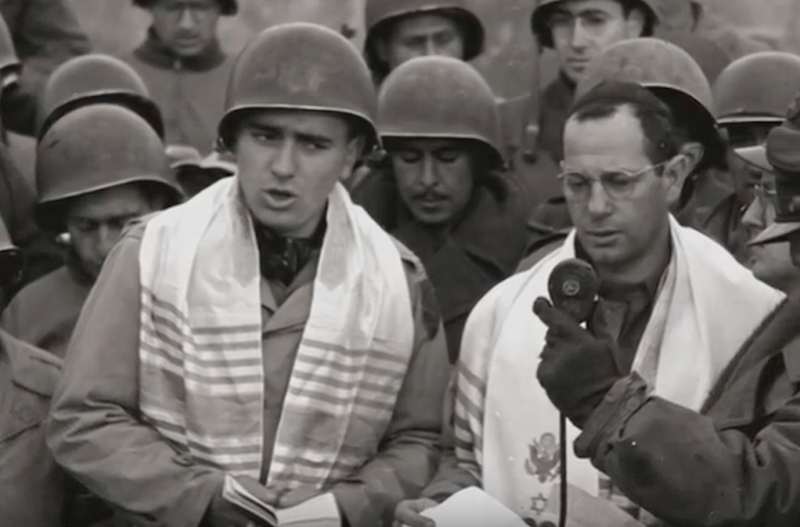 Fuchs, an Army rifleman who led the 1944 Shabbat service in Aachen alongside Army chaplain Rabbi Sidney Lefkowitz, for some 50 Jewish-American soldiers, died Tuesday, according to The New York Times. It was the first Jewish service broadcast from Germany since the rise of Hitler more than a decade earlier, and was shown throughout the United States and in Germany. The Army division had no cantor, so Fuchs agreed to fill the role. “Since I was the only one who could do it, I tried my best,” Fuchs told The Times. Fuchs, a native of Poland, moved to New York at age 12 with his family. After the war he studied cantorial music and served as the cantor of the Bayside Jewish Center in Queens, and also worked as a diamond cutter in Manhattan, The Times reported. Fighting in the war left Fuchs with nightmares, and he rarely spoke about his experience with his family, though he did hang a photograph in his home of himself leading the iconic service. Previous Article Save the date—November 17.